Need a healthy idea for something to serve on Christmas morning? 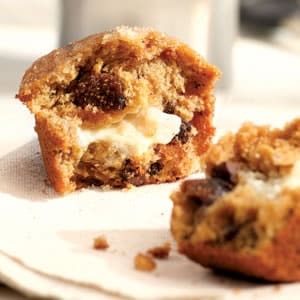 Well these amazingly delicious Goat Cheese and Fig Muffins are not only tasty and festive, they are just 5 Points each. 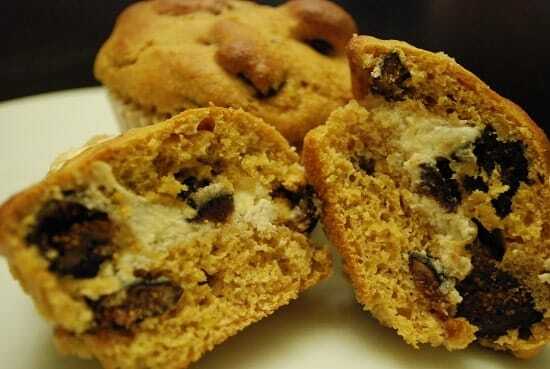 Each healthy fig muffin is stuffed with a rich, creamy honey and goat cheese filling. They are moist and fluffy, and oh-so yummy! The combination of the sweet figs and honey combined with the tangy goat cheese make for a wonderfully decadent treat. These yummy muffins also make a great gift to bake for your friend, neighbor, or child’s teacher! Make a batch of these healthy Goat Cheese and Fig Muffins for Sunday morning, and then enjoy one for breakfast all week long. They’d also make a great Christmas morning breakfast recipe idea! Preheat oven to 425°F. Line 12 (1/2-cup) muffin cups with paper liners or coat with non-fat cooking spray. Thoroughly combine goat cheese, honey, lemon zest and 1/4 teaspoon vanilla in a small bowl. Set aside. Whisk flours, baking powder, baking soda and salt in a large bowl. In another bowl, beat liquid egg substitute and egg white; add brown sugar and the remaining 1 teaspoon vanilla and whisk until the sugar is dissolved, about 1 minute. Gradually whisk in buttermilk and pumpkin until smooth. Add the wet ingredients to the dry ingredients and stir until just combined; don’t mix too much. Spoon half the batter into the prepared muffin cups. Add 1 teaspoon of the reserved cheese filling to the center of each muffin, and cover with the remaining batter.